Please see the update below. We must begin by noting that Doug Wardlow, the default candidate of the Republicans for attorney general in Minnesota, holds himself out as a great 1st Amendment lawyer. Yes, and as I have often observed, I am Louis the Sun King. We’ve had a chance to see the great 1st Amendment lawyer in action in recent days. But Dougie, and his puerile campaign manager Billy Grant, who we might call “Defendant #2,” have a really loose grip on the law of libel. 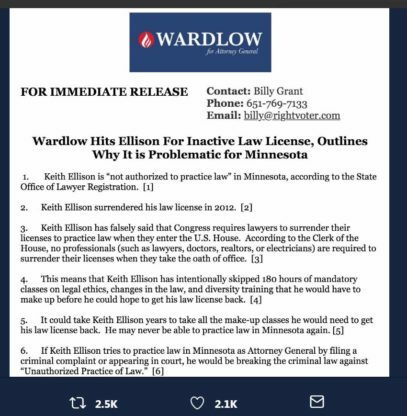 GOP AG candidate Doug Wardlow sent out a release this week about Ellison’s inactive law license, which would seem to be inconvenient for a sitting attorney general. As it happens, I looked into this a couple months ago. Ellison has an inactive license, for which he paid his dues in February. It’s true he has to do continuing legal ed to get back to full status, but his campaign told me a couple months ago he’s been doing it this summer. Why inactive? The House ethics manual advises against practicing law while in Congress: “Under the Ethics Reform Act, Members and senior staff are prohibited from engaging in professions that provide services involving a fiduciary relationship, including the practice of law….” Page 214-215. Sen. Amy Klobuchar has the same inactive status, as it happens. That was a bracing dose of reality, wasn’t it? Keith Ellison, as a congressman and a candidate for attorney general, is most certainly a public figure. He’s hard to libel under New York Times v. Sullivan, but it isn’t impossible. I believe that Doug Wardlow and Defendant #2 have managed to do it. Under the Times v. Sullivan standard for public figures, in order to libel them you have to make a false statement about them that either you knew was false, or you didn’t care whether it was true or false. Let’s parse the release by Wardlow and Defendant #2. Ellison “surrendered” his law license in 2012. He didn’t surrender it; it was inactive. It went inactive in 2012 according to the press release. Ellison falsely stated that his license became inactive because that is what the Congressional manual says to do. According to J.P. Coolican, Ellison is right and Wardlow and Defendant #2 are wrong. Ellison “intentionally skipped” 180 hours of continuing legal education. First of all, when a law license is inactive, the attorney doesn’t have to take CLE. Keith Ellison didn’t skip anything. Second, if the license became inactive in 2012, as Wardlow and Defendant #2 say, that was six years ago. The rule for CLE attendance in 15 hours per year. Six times fifteen is what, Doug? “180?” says Doug. Of course, it’s ninety. Per Rule 12C(2)(b) (www.cle.mn.gov/rules), we offer a discretionary transfer option for attorneys seeking to return to active status. An attorney may return to discretionary active status upon receipt of the transfer fee and at least 45 credit hours completed (to include at least 3 ethics and 2 elimination of bias), with the caveat that they will complete the remainder of their CLE obligation according to a mutually agreed upon plan. Lawyers move from inactive to active status all the time. It is a simple matter to do, and it can be accomplished easily by Keith Ellison by the time he is sworn in — and he will be — in January. Either Doug Wardlow and Defendant #2 knew these things or they could have learned them with a few simple phone calls. Instead, they decided to publish statements that were knowingly or carelessly untruthful about Keith Ellison’s ability to practice his profession. They did so maliciously in the language of Times v. Sullivan, the standard that must be met for a public figure to to successfully pursue a libel case. This is a image of the tweet. Here’s a link to it. You can see that the libel has been republished 2,500 times. 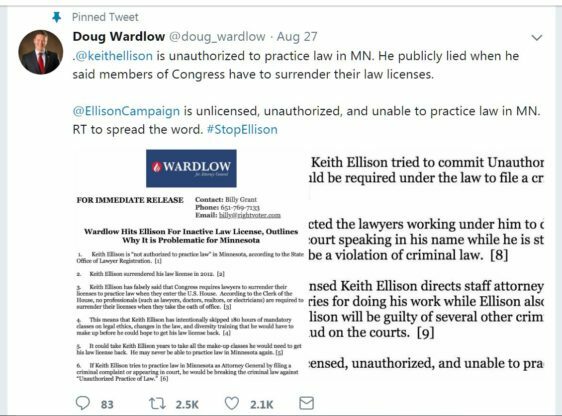 If Doug Wardlow and Defendant #2 have a lick of sense, they will pull down all references to the press release, and replace it with corrective advertising, take other remedial steps to cure the effects of the libel, including advertising in general circulation newspapers around the state, and last but not least, issue an apology to Keith Ellison. 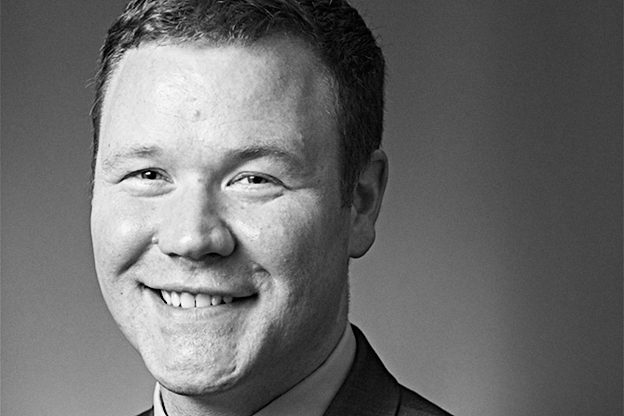 Doug Wardlow is auditioning for the top lawyer spot in Minnesota. He’d like you to think he’s a bright and credentialed guy. I think he’s just sloppy. Keith Ellison comes to Drinking Liberally this week!